We learned a lot of lessons on our journey into Croatia one being that after spending that much time solely together it is easier to forgive and understand your part in the conflict or in this case, taking rogue directions. Riding towards Croatia started with one of the best rides we have had on this journey. We knew we had a relatively heavy day, about 75km, but the roads were so glorious on the first 40km we couldn’t imagine that it could be anything but a record speed, fantastic day in the saddle. To cross into Croatia we needed to ride on the Hungarian dyke path until we reached Mohacs where we could cross the river on a ferry and decend the rest of the way through Hungary on the other side of the Danube into Croatia. It should be noted that this is the recommended Eurovelo route, but for those who would rather skip out Croatia, you can continue on the path into Serbia towards Belgrade. We arrived at Mohacs just as the ferry was arriving thinking we had fantastic luck on this day. Unfortunately however the ferry operator informed us that we had needed to buy tickets from a cafe around the corner before we were able to board. We had taken lots of ferries prior to this point and all of them had allowed you to buy the tickets on board. We pleaded with the man to wait 5 minutes and allow us to run over and buy the tickets, but he refused. I took this as a sign that we should continue on the dyke path (off our planned route) into Serbia with the hope that we could then cross at Batina. Possibly even saving ourselves 20 km! This plan started off swimmingly well. We flew along for another 10 – 15km until we saw what looked like a border post. Unfortunately this turned out to be a military post with Hungarian soldiers informing us we couldn’t continue the 10km on the comfortable dyke path through Serbia to a crossing into Croatia, but instead we needed to travel an extra 40km out of our way back into Hungary around to Serbia and find our own way back to the Croatian border. At this point, as is typical on a bike tour the weather changed, it started raining pretty heavily and as soon as we left the lovely paved path we found ourselves on terrible potholed roads which eerily had Hungarian military posts (with machine guns) about every 100 meters. At this point my partner’s anxiety really started to rise. Unlike me, he tries to plan this bike tour completely before every ride and during a momentary feeling of wanderlust he allowed me to make the call that we should go off the route. We found the one and only cafe and realised that if we wanted to get to Croatia that evening we would need to take two major roads through Serbia. Not yet having entered Serbia and through my partner’s extensive reading of other peoples blogs who had completed the tour, we were worried that the roads might be too large to go on with bikes and that the Serbian drivers would not be very accommodating. Luckily it was a lot of worry for nothing. We did have to ride an extra 25km over the entire expected days ride but the roads in Serbia were ok and we finally arrived at our hostel in Croatia! Unfortunately as soon as we arrived we were informed by the woman who was overseeing the place that we would need to pay in cash and the closest ATM was 30km away. Not being able to face adding another 60km to our day, I begged the woman (who spoke no English) to help us. Before I knew it she had contacted her son who sped me to a cash point. After a tiring day it was great to finally speak to someone in our newest visited country, Croatia. Unfortunately he, like me, had a small town itch and wasn’t too complimentary about his little area of Croatia, but he did inform me that Belgrade was amazing and his words to describe it precisely were, “Belgrade is the centre of our universe” so that definitely wet my appetite for our next big city. After all of that, we settled, exhaustedly, in to our 8th country and looked forward to a couple days off in the largest town we would visit in Croatia, Osijek. I don’t have a lot to say about our time in Croatia, other than my extended explanation of our journey in, because we only had about two days ride in the country and we stayed close to the border on the far eastern side. I don’t think it would be fair to define a country based on this experience especially since the majority of towns and people in Croatia inhabit the far western coast of the country. Some observations we did have, was that the roads were better maintained in Croatia than in Hungary, or the little of Serbia we had already experienced. We guessed this may have been due to their success in tourism. It is cheap where we were in Croatia, actually similar prices to Hungary (although the grocery shopping was a bit more expensive). The evidence of the, not so long ago, Yugoslavian war was very noticeable. For example, in the major towns we visited, Osijek and Vukovar, there were still many buildings covered in gun shot wounds and monuments and memorials for the war can be seen everywhere. The drivers started getting bad again as soon as we entered Croatia, and by bad I mean it is the first country that we visited on our travels which I would liken to English drivers. They don’t give you enough space and they often pass you even if another driver is passing on the opposite side of the road. It should be noted that Eurovelo 6 pretty much ceases to exist from Croatia on and there are no longer recommended bike routes, it is really just a series of recommended roads to ride, so you are all of the sudden very much amongst all of the other traffic. Finally, and maybe most surprisingly to us was the patriotism that we encountered in Croatia which I can only liken to the immense patriotism you see in the USA. We did plan our journey into Croatia to coincide with watching their final world cup match against Switzerland and their current dominance in the tournament may have had something to do with the patriotism. But it was really interesting to see flags everywhere; on cars, buildings and parks. The support for the football team was so expansive, children and adults were walking around in the football shirts all days of the week, not only when their team was playing. They covered their cars’ hoods in football flags, and probably our favourite of these idosyncrosies were the amount of football songs that were written for the tournament and played regularly on tv. We heard at least five football songs when we were there. All of which we loved, I should add! All in all I would say my experience in Croatia made me regretful. I wish I had seen more and my partner and I vowed we will definitely go back to the coastal side of the country. Unfortunately I really felt we only got to scratch the surface of experiencing a very interesting country. My experience in Austria, I guess like everywhere I have been so far, was very different to the other countries that I have visited thus far on this trip. Although Austria is a very big country and a large chunk of the trip we got through it at a record pace, spending a total of only 6 days riding through it. Part of the reason for this was the cost, we always knew Austria would be one of the most expensive countries we would visit, and part of it was the quality of the route, it is 95% flat (if not downhill) and generally on very good paved roads. For this reason during our travels through Austria we beat our fastest speeds by nearly 2 miles an hour! I should clarify however that I don’t think everyone should necessarily speed through Austria; if you have the money, take your time because this was some of the most beautiful riding which we encountered throughout the trip. So much so, unfortunately unlike the other countries we visited, I probably won’t remember Austria for the people or the beautiful towns but I will always remember riding on the forest path beside the Danube. We entered Austria after Passau and quickly realised we were on the cycle tourers tourist super highway. 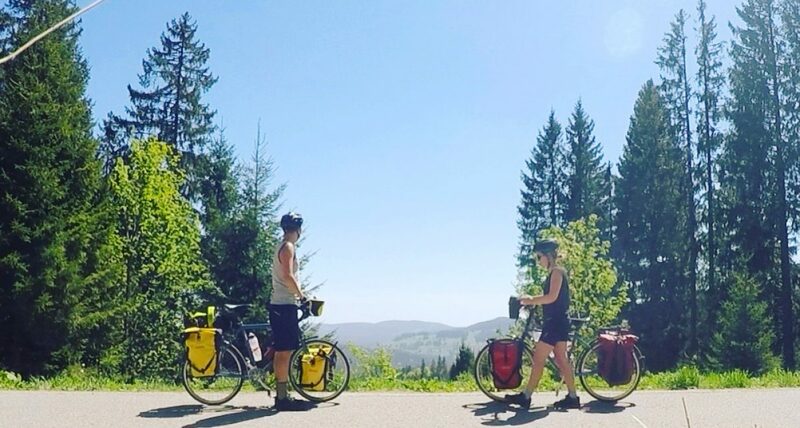 The ride between Passau and Linz is particularly famous, for good reason, it is beautiful, but all the cafes, restaurants and even campsites feel like they have been set up along the route to attract cycle tourists and take their money. And when I say cycle tourists, that is what they are, many groups are on the route with rented cycles or e-bikes and for the first time on our trip we were surrounded by cycle traffic. Another hurdle that was affecting our journey was the very sudden change in weather. Every day started reaching 30 degrees C or higher (around 90F) and this really made the riding hard for us. We realised we needed to get up earlier and we needed to carry a lot more water on the bikes. One of our new rules became, stop at every cafe you see for a coffee, ice cream and water refill. We also started looking for public swimming pools wherever we could along the route. You can swim in the Danube, and apparently, just outside of Vienna every one does naked. But we kept worrying that this would make us more sticky during our journey. Looking back I do wish we were a bit more YOLO about this. It also becomes frustrating when you realise you are carrying a lot of extra weight with your warm weather clothes and in reality you are only wearing your one, lightest, tank top every day. We had gotten so used to only being able to get around on the bike or by foot that when we realised that on this part of the Danube route you often had to take ferries back and forth over the river we were pleasantly surprised and sometimes frustrated by this. Because the Danube is so wide in this part of the world and there isn’t always a river path on both sides, the route leads you to ferry stops that take you and your bike across the river. The ferries are a bit of fun at first but when you are trying to make good time and save as much money as possible they can be frustrating. We seemed to keep getting ourselves into situations where we would try to avoid the ferry to get to a bridge but then we would take the wrong bridge and inevitably need to take another ferry. After Passau, our next destination for a rest day was Linz. I obviously mainly wanted to visit this town to taste the famous tart. We arrived to the town on another sweltering day and unfortunately we again felt like we were taken advantage of. We didn’t realise that often in restaurants and bars in Austria they round-up the bill to add on a tip for themselves, and because I guess this cafe didn’t serve Linzer tart, they gave me a linzer cake and told me that was what I wanted. The cake was good, so I am not complaining, but this did force me to have to order a tart again later in the evening. Linzer is a very pretty small town and you can ride the old tram up the mountain for views of the whole city and the river which is really nice. We had been planning for my partner’s mother to join us in Vienna since the beginning of the trip so we hurried on to meet her there a few days after Linz. It definitely felt out of our comfort zone to have a visitor from home after this long on the road. At first we couldn’t stop chatting, but soon it felt a little frustrating that this was getting in the way of our routine. I guess it shows how insular this experience can be and how good it is to have others to open up your head space again. Plus, a dinner out on her felt like a massive treat! I have travelled to most large European cities but Vienna has remained on my list for many years. As with most of these trips I had a set plan of all the tourist sites I wanted to see, and when; and I wanted to have it all booked ahead of time. This usual plan of action didn’t fit as well into cycle touring tourism as I had hoped. First of all I hadn’t bargained for how tired I would be and the miles and miles of hoofing it around the city weren’t as welcome as they usually are. Tourist attractions also seemed a lot more expensive and not as worth it as they usually do. This is probably because we had already been visiting tourist attractions for the last two months and visiting another cathedral for twice the usual cost just didn’t seem worth it. Saying all this Vienna did have some unmissable attractions for me. I have waited a lifetime to see Klimt’s Kiss and, for me, it was worth every day’s wait, as was the rest of the Klimt collection in The Belvedere castle. I was determined to see a symphony performance when I was there and the knowledge that you are watching a performance in the luxurious Musikverein where both Motzart and Beethoven played was probably my favourite thing we did in Vienna. We also meandered around the palaces and walked through the beautifully clean old streets staring at the beautiful architecture of Vienna with the knowledge that the greatest composers of all time walked these streets too. Too soon it was time for us to leave Vienna and we were excited to move onto our next city and crossing another border into Slovakia. On the Eurovelo 6 you only enter Slovakia for less than a day’s ride, but you do have the pleasure of entering the fabulous city of Bratislava. It’s surprising to cross from Austria to Slovakia because you immediately notice that pretty much everything you buy is at least half the price and I have to admit there was an immediate change in the quality of the roads on the route. Again on our own we were pleasantly surprised by the vibrant city of Bratislava. It is beautiful and youthful feeling, filled with history and culture much like Vienna. We spent our time there meandering up to the castle and fortress that surrounds the city, relaxing in the cafes and eating food that reminded me of home (peirogis). I really wish we had planned to spend more time in that wonderful city. Travelling on we quickly became aware that now we had entered eastern Europe and the comfort and easiness of western Europe no longer existed. We were incredibly excited to start discovering new cultures and again riding on.